What the heck is an Open Mic Night? What is an “Open Mic” anyway? There’s, like, a bajillion of these things in Windsor. They happen every night of the week, mostly on weekdays, but now they even happen on weekends. We’ve been running a steady Open Mic night on Mondays since we opened almost eight years ago with the intent on bringing in those musicians that are intent on cutting their teeth on live performance. Playing in front of a crowd. Taking your craft (whether singing cover songs or playing originals) to the stage in front of an intimate crowd is the bridging point between your bedroom and booking a full-blown gig. You don’t compete with a TV (or twelve) at Phog. We love sports and weird old movies, but when there’s music playing on stage, it’s music time. And we have an actual piano if you think the room will be quiet enough (until we get an area mic for it). It’s a great chance for songwriters to meet one another when they would otherwise not know about one another. It’s a place where often-hidden talents come out and surprise those in the crowd…sometimes encouraging partnerships with more established performers. And that’s the kind of thing we want to foster. It’s called Open Mic so that anyone can get up and play three songs. The host opens the night up with a handful of songs, and plays in between sets if there aren’t any willing performers in the crowd. James O-L is one of our city’s constant songwriters, and he’s connected to TONS of musicians in every type of musical genre…and he actually brings a guitar and keyboard for performers to use…so that you don’t need to bring anything aside from your willingness to play. There are no expectations. I often hear that there’s apprehension to get up in front of a “Phog crowd”, but all our Open Mic spectators and participants want is “new”. They want new faces, new ideas, new sounds. 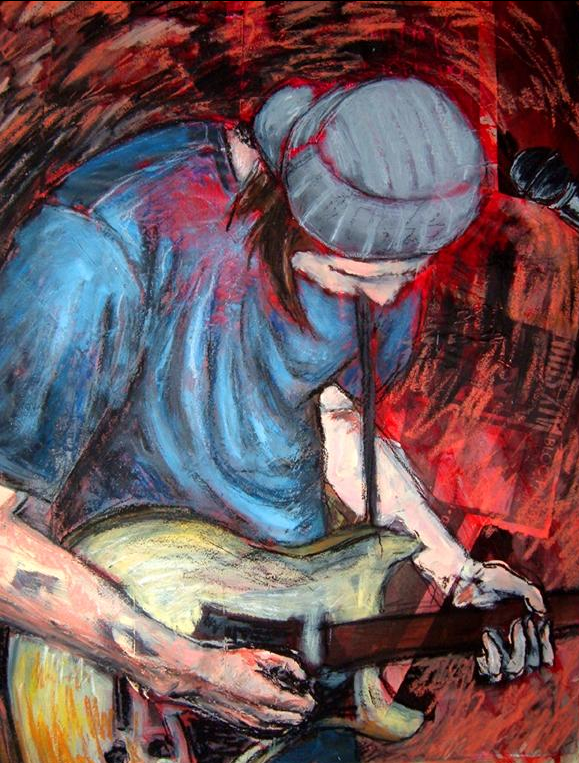 It’s a place that you might get kudos, advice, or propositions to start a band. At the very least, you get to stand on a stage that has been occupied by some of the best in Canada and belt it out for a live audience. If you like it, you can come back and do it again. People are often curious what kind of performance is encouraged at our Open Mic Surgery, and I’ll answer it by giving direct examples that’ve been very different, and all very qualified. We’ve seen a heck of a lot. 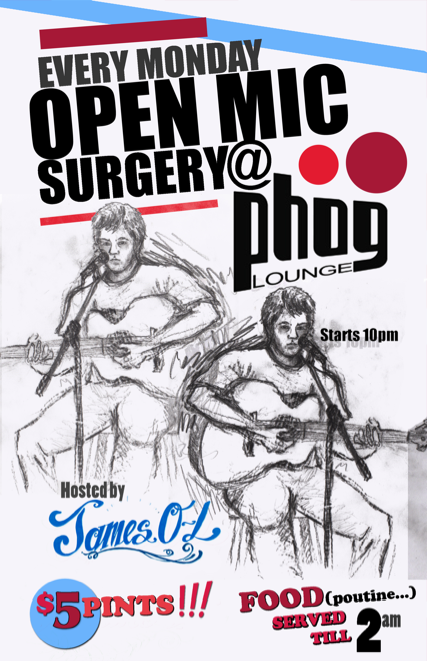 If you have something you want to share, try out, or get an opinion on…bring your butts out to James O-L’s Open Mic Surgery any Monday night. Now we have $5 micro–brew pints (20 ounces, which is larger than any other music venue in downtown). We do it right. So come and listen, maybe find your next band-mate, and be “open” to new sounds. This entry was posted in Uncategorized and tagged Bulletproof Tiger, Corey Temesy, Craig Cardiff, Efan, James O-L, Kimba Elliott, Michou, Monday, open mic, Open Mic Surgery, phog lounge, Ray Whimsey, Stephen Hargreaves. Bookmark the permalink.